You are not required to be a member of Northlake in order to attend our services or participate in most aspects* of life of our church community. However, if Northlake becomes an important part of your life, we encourage you to consider committing to our community by becoming a member. Subscribe to our email list for weekly announcements – email office@northlakeuu.org to sign up. Volunteer! We’d love to have your help with making coffee, helping out with our kids’ programs or worship services, on a committee or supporting a social justice project. Step 2: Attend a newcomer orientation luncheon, sponsored by our membership committee. Step 3: Meet with our minister, Rev. Jim VanderWeele. Step 4: Sign the membership book. Then the board approves membership. Step 5: Be welcomed by the congregation! 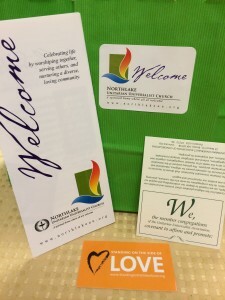 Once you are a member of Northlake, you’ll continue your participation in the life of the church, including participating in the democratic processes of our UU congregation such as voting on governance matters, making a monetary contribution each fiscal year that is significant for you, and giving of your time and talents to support Northlake. To learn more, contact the membership committee. * Membership is required to vote at congregational meetings on issues such as electing the board of trustees, approving the budget, and calling a new minister.